Superior construction meets the rigorous demands of professionals and students with the Pentel Sharp Mechanical Pencil. Known as Pentel's most popular mechanical pencil, the Sharp is now available in a variety of eye-catching metallic finishes. Pre-loaded with Pentel Hi-Polymer HB lead, this stylish, well-constructed mechanical pencil features a fixed sleeve that protects the lead when used with templates or rulers, a ribbed finger grip for a firm hold, Quick Click lead advance, an eraser under the pencil's cap, and a pocket clip. 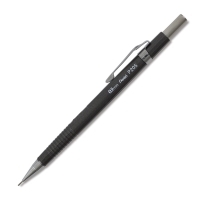 ® Pentel is a registered trademark.™ Sharp is a trademark.